Immunoprecipitation of HeLa cell lysates, untreated or TPA-treated, using XP® Rabbit IgG (DA1E) mAb Isotype Control (Sepharose® Bead Conjugate) #3423 (Lanes 1 and 2) and Phospho-p44/42 MAPK (Erk1/2) (Thr202/Tyr204) (D13.14.4E) XP® Rabbit mAb (Sepharose® Bead Conjugate) (Lanes 3 and 4). The blot was probed using Phospho-p44/42 MAPK (Erk1/2) (Thr202/Tyr204) (E10) Mouse mAb #9106. 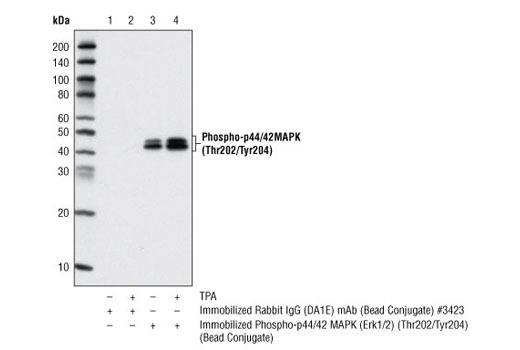 Phospho-p44/42 MAPK (Erk1/2) (Thr202/Tyr204) (D13.14.4E) XP® Rabbit mAb (Sepharose® Bead Conjugate) detects endogenous levels of p44 and p42 MAP kinase (Erk1 and Erk2) when dually phosphorylated at Thr202 and Tyr204 of Erk1 (Thr185 and Tyr187 of Erk2), and singly phosphorylated at Thr202. This antibody does not cross-react with the corresponding phosphorylated residues of either JNK/SAPK or p38 MAP kinases. This Cell Signaling Technology (CST) antibody is immobilized via covalent binding of primary amino groups to N-hydroxysuccinimide (NHS)-activated Sepharose® beads. Phospho-p44/42 MAPK (Erk1/2) (Thr202/Tyr204) (D13.14.4E) XP® Rabbit mAb (Sepharose® Bead Conjugate) is useful for immunoprecipitation assays. The unconjugated Phospho-p44/42 MAPK (Erk1/2) (Thr202/Tyr204) (D13.14.4E) XP® Rabbit mAb (#4370) reacts with human, mouse, rat, monkey, mink, pig, Saccharomyces cerevisiae, Drosophila melanogaster, hamster, bovine and zebrafish Phospho-p44/42 MAPK protein. CST expects that Phospho-p44/42 MAPK (Erk1/2) (Thr202/Tyr204) (D13.14.4E) XP® Rabbit mAb (Sepharose® Bead Conjugate) will also recognize phospho MAPK in these species.